Is anyone else totally in love with World Market? (This isn't a paid post by any means, I just adore that store!) I love how many fun, cute, and quirky things I find there every time I visit, not to mention all the amazingly yummy foods they sell. We visited the store a few weeks ago to do our usual stock-up on German chocolates and silly gummy candies for the girls, and I found this cute cookie stamp. Maybe I'm just a 12 year old at heart, but it made me giggle. And if you can't tell people "Bite Me" at Halloween (accompanied by vampire teeth) when can you? I tried a few different recipes with the stamp before I figured out that the dough needs to be pretty firm and not rise or spread much for the stamp to work (duh...). I found a great looking shortbread cookie recipe on one of my very favorite blogs, and whipped up a batch. Not only were the cookies fun to look at, they were super delicious! The vanilla almond combo is great, and the cookies themselves are buttery and crisp, while still soft in the middle. I like that they're a little less crumbly and hard than the usual shortbread cookies. 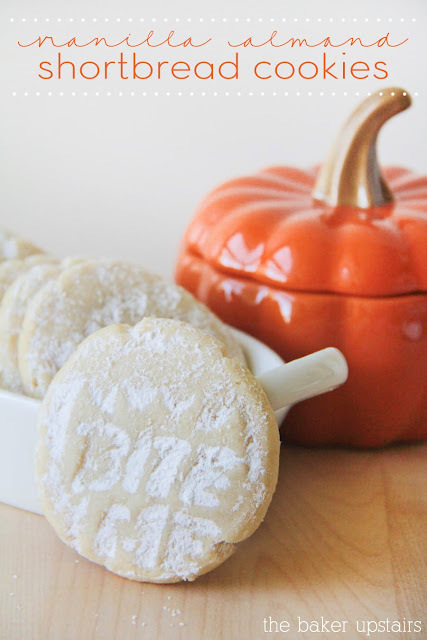 They'd be delicious and perfect even without using a cookie stamp, too! Preheat oven to 375. Cream together butter and sugar, then add egg yolk, vanilla, and almond, and mix until combined. Mix in salt, baking powder, and flour until just combined. Shape dough into golf ball-sized balls, and place on a lightly greased baking sheet. Stamp with cookie stamp (or flatten with the bottom of a glass. Bake 10-12 minutes, or until lightly golden brown. Let cool and dust with powdered sugar, if desired.